Braids are some of the most versatile types of hair styles today. They can be done as part of an elaborate updo for a special occasions, as a way to keep hair off the face, or as a semi-permanent style that is kept in the hair for months. Depending on the style of braid, it can take anywhere from a few minutes to several hours to have braids done, so it is important to understand the different styles of braids. 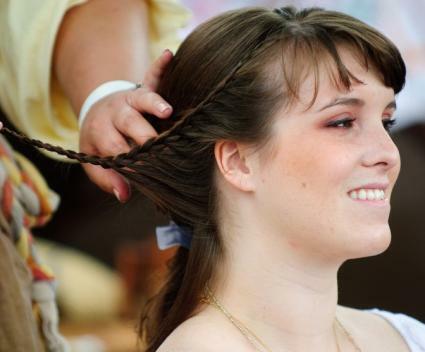 There are two basic types of traditional braids, all of which involve taking all of the hair and creating one individual braid on the head. These styles are more popular on Caucasian hair but can be done on any hair type. Regular three stand braids are the easiest of all the methods of braiding hair and generally only take a few minutes to complete. Hold the hair in one hand, as if you were about to put it in a low ponytail. Divide the hair into three sections of the same size. Hold the left piece between your thumb and forefinger on your left hand. Hold the middle piece with the tip of your right forefinger and thumb. Hold the right piece between your thumb and forefinger, as well, closer to your palm. Take the piece from the right side and cross it over the middle one. Shift the formerly middle piece closer to your palm to replace the piece from the right side. Repeat on the left side. Follow suit on the right side again, and then to the left until you're done with the length of the hair. French braiding still involves three strands of hair. This is a slightly more elegant version of the traditional 3-strand braid. It works better for girls with medium-to-short or layered hair because the shorter pieces are woven in and held secure by the longer pieces. Instead of starting with all of your hair in your hand, start with just the front and sides, as if you were going to do a half-updo. Divide that portion of hair into three sections. 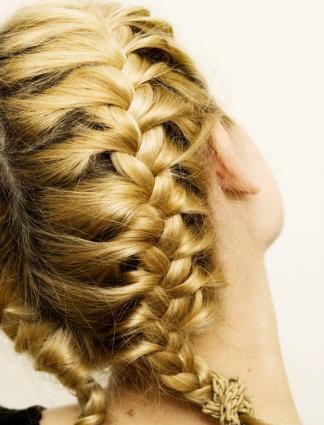 Just as you did with the regular braid, pull the right piece over the middle. When you take the formerly middle piece to the right side, add a bit of hair to it from the side near your temple. Repeat the process on the left side. Continue down the length of the hair, adding a bit of hair each time. Once all of your hair is intertwined, continue braiding hair as with the traditional type -- 3 thick strands. Secure the finished braid with a ponytail holder or other accessory. 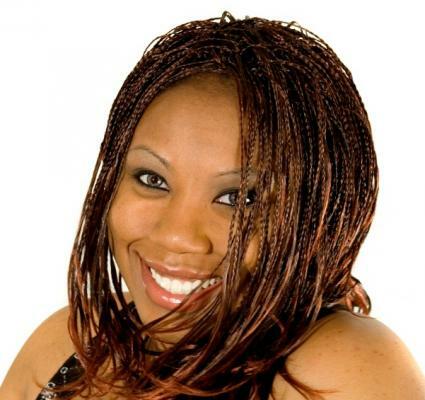 There are also certain types of braids that are more commonly done on African American hair. These braids are typically left in the hair for several weeks or months. These braids also require thick, coarse hair, like African American hair to stay in the hair and to look their best. Cornrow braids are small, tight braids completed close to the scalp. Cornrows are typically done in straight lines and cover the base of the head. However, there are more elaborate versions of this braid. The hair is basically braided into several small types of French braids that stay attached to the head. Cornrows should typically be done by a professional braider, and will take at least a few hours to complete. Comb and part the hair into even rows across the head. The rows can be as thick or as thin as you want the braids to be. Take a small amount of hair, from the place where you want the braid to start, and do two rotations of a basic three strand braid. Then take another small portion of hair, from the same parted section, and add it to the middle section of hair. Braid another "stitch" or rotation. Repeat the process until all of the hair in that row has been braided. Repeat until the entire head of hair has been braided into rows. Expect to leave these braids in for several weeks once they have been done. These braids are very tiny, delicate three-strand braids that are tightly woven into the hair. These braids generally last several months and are most commonly done to add extensions to the hair. When extensions are micro braided into the hair, the extensions tend to last longer, and less damage is done to existing hair. With micro braids, many times either the hair is braided from root to tip, or simply the hair near the root of the hair is braided in with extensions. A micro braid is generally not visible to the naked eye. Micro braids are simple to do, the only challenge lies in how small the braids are. Basically the hair is separated into tiny sections, and basic three strand braids are done to the hair. The process is the same when adding extensions. Step by step instructions and videos on how to do micro braids and how to micro braid extensions into the hair can be found on LovetoKnow's micro braid page. Tree braids are a popular style of African American braids, similar to micro braids. Tree braids are small but not as tiny as micro braids and are much more visible. Tree braids are used only to add extensions to the hair. 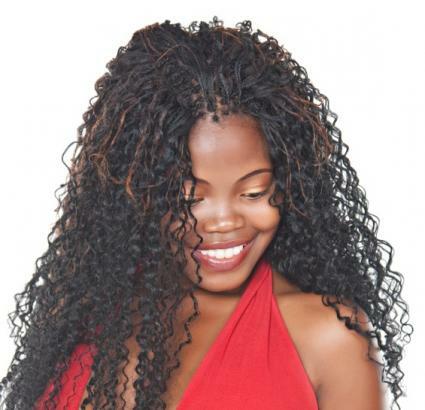 There are two types of extensions that can be used with tree braids: synthetic and human hair. Synthetic extensions: These extensions are more affordable than human hair extensions. However, braids that use synthetic hair extensions do not last as long as those with human hair extensions. Heat styling must also be avoided with these extensions. Human hair extensions: Human hair extensions can be very expensive, but they also can last for months longer than synthetic versions. Styling and caring for human hair extensions is the same as caring for natural hair. Once the extensions have been chosen, tree braiding the extra hair in with natural hair is a fairly straightforward process. Take a section of hair, approximately 1/2 inch wide and comb out any tangles. Divide this section into three equal parts. Place an equally thick section of the hair extension, directly underneath the section of hair you just separated. Separate the extensions into three equal sections as well. Combine the natural hair and extensions together and do a basic three strand braid. Cross the left section over the middle section and tighten, and then cross the right section over the middle section and tighten. Repeat this process until all of the hair has been braided. After a while, only the extensions will be used in the braid. Secure with a hair tie. Repeat until the entire head of hair has been braided. If there are pieces of hair sticking out in the braid where your natural hair ends, snip these ends off with a scissors. Whether you are having your hair braided for a special night out or are looking to have extensions braided into your current locks, it is important to research your braid style first, and consult a professional hair stylist if it is your first time getting these braids. 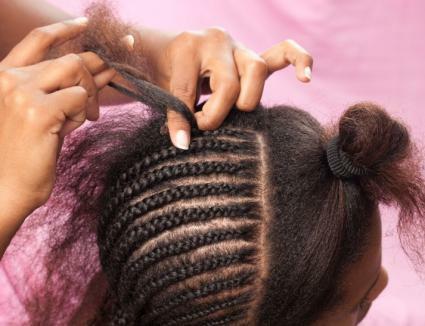 Doing this will ensure your hair stays healthy and the braids won't damage your hair.